Rated by the British Medical Journal as one of the top 15 breakthroughs in medicine over the last 150 years evidence-based medicine (EBM) is an idea that has become highly influential in both clinical practice and health policy-making. EBM promotes a seemingly irrefutable principle: that decision-making in medical practice should be based, as much as possible, on the most up-to-date research findings. Nowhere has this idea been more welcome than in psychiatry, a field that continues to be dogged by a legacy of controversial clinical interventions. Many mental health experts believe that following the rules of EBM is the best way of safeguarding patients from unproven fads or dangerous interventions. If something is effective or ineffective, EBM will tell us. But it turns out that ensuring medical practice is based on solid evidence is not as straightforward as it sounds. After all, evidence does not emerge from thin air. There are finite resources for research, which means that there is always someone deciding what topics should be researched, whose studies merit funding, and which results will be published. These kinds of decisions are not neutral. They reflect the beliefs and values of policymakers, funders, researchers, and journal editors about what is important. And determining what is important depends on one’s goals: improving clinical practice to be sure, but also reaping profits, promoting one’s preferred hypotheses, and advancing one’s career. In other words, what counts as evidence is partly determined by values and interests. 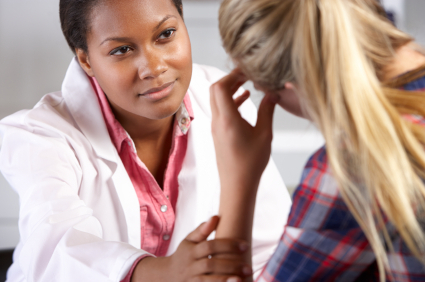 Teenage Girl Visits Doctor’s Office Suffering With Depression via iStock. ©monkeybusinessimages. Let’s take a concrete example from psychiatry. The two most common types of psychiatric interventions are medications and psychotherapy. As in all areas of medicine, manufacturers of psychiatric drugs play a very significant role in the funding of clinical research, more significant in dollar amount than government funding bodies. Pharmaceutical companies develop drugs in order to sell them and make profits and they want to do so in such a manner that maximizes revenue. Research into drug treatments has a natural sponsor — the companies who stand to profit from their sales. Meanwhile, psychotherapy has no such natural sponsor. There are researchers who are interested in psychotherapy and do obtain funding in order to study it. However, the body of research data supporting the use of pharmaceuticals is simply much larger and continues to grow faster than the body of data concerning psychotherapy. If one were to prioritize treatments that were evidence-based, one would have no choice but to privilege medications. In this way the values of the marketplace become incorporated into research, into evidence, and eventually into clinical practice. The idea that values effect what counts as evidence is a particularly challenging problem for psychiatry because it has always suffered from the criticism that it is not sufficiently scientific. A broken leg is a fact, but whether someone is normal or abnormal is seen as a value judgement. There is a hope amongst proponents of evidence-based psychiatry that EBM can take this subjective component out of psychiatry but it cannot. Showing that a drug, like an antidepressant, can make a person feel less sad does not take away the judgement that there is something wrong with being sad in the first place. The thorniest ethical problems in psychiatry surround clinical cases in which psychiatrists and/or families want to impose treatment on mentally ill persons in hopes of achieving a certain mental state that the patient himself does not want. At the heart of this dispute is whose version of a good life ought to prevail. Evidence doesn’t resolve this debate. Even worse, it might end up hiding it. After all, evidence that a treatment works for certain symptoms — like hallucinations — focuses our attention on getting rid of those symptoms rather than helping people in other ways such as finding ways to learn to live with them. The original authors of EBM worried that clinicians’ values and their exercise of judgment in clinical decision-making actually led to bad decisions and harmed patients. They wanted to get rid of judgment and values as much as possible and let scientific data guide practice instead. But this is not possible. No research is done without values, no data becomes evidence without judgments. The challenge for psychiatry is to be as open as possible about how values are intertwined with evidence. Frank discussion of the many ethical, cultural, and economic factors that inform psychiatry enriches rather than diminishes the field. Heading image: Lexapro pills by Tom Varco. CC-BY-SA-3.0 via Wikimedia Commons. Mona Gupta is a psychiatrist and researcher at the Université de Montréal in Canada. Her areas of academic interest are in bioethics and the philosophy of psychiatry. Dr. Gupta is widely published on the subject of ethics and evidence-based medicine. 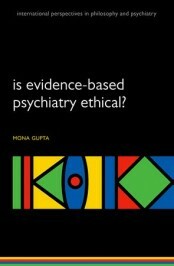 She is author of Is evidence-based psychiatry ethical?